A bountiful table is the hallmark of the Thanksgiving holiday. They say that we eat with our eyes before we eat with our mouths, so here are some decorating tips and ideas that will surely impress your guests and enliven your feast. Incorporate nature’s bounty: Use fresh fall leaves in addition to pumpkins and a variety of autumnal squash to serve as a table decor. Other natural items can be found in your own backyard. Consider adding pine cones, rustic branches, driftwood, acorns, fresh vines and even berry stems to the table setting. Use natural aromatics: There are many decorative details tucked away in the spice cabinet. Sprigs of rosemary and thyme are natural aromatics that will highlight Thanksgiving dishes and decor. Cinnamon sticks add a nice touch to place settings and napkin holders. Use colorful dried fruit to accent your other decorations. Add color: Want to liven up your table this year? Paint the pumpkins, squash, pine cones, and berry stems to match your particular color scheme, dining room, or place settings. Consider elegant and stunning colors such as copper, silver, gold, or rose gold. Or brighten it up with pink, red, or purple. One can of spray paint can go a long way in adding a pop of color to your holiday. Use a single color: Create a pattern of matching decorations by using different shades of a single color. For example, all-white pumpkins atop a wooden table, or different shades of orange items to pop against a white table cloth. Combine decorative items: Use oranges, pumpkins, or colorful pitchers as flower vases. Grab extra pears, apples, nuts, or beautiful twigs to incorporate into flower arrangements or table runner decor. Place candles into jars and surround them with hazelnuts, acorns, candy corn, or coffee beans. Mix and match different sized baskets, bowls, glasses, and plates. Go big with decorations to celebrate the bounty of the season. Or keep it simple by using a single centerpiece, or by using bright apples or small pumpkins as candle holders. Don’t forget the personal touch: Want to put the kids to work? They can write names or thematic words onto decorative fruit. They can turn their handprint turkeys into place settings, or list their blessings on leaves and create a decorative wreath or two. Send them outside to gather fresh leaves to use as place cards. Give a gift: Consider decorating each place setting with a small gift for your guests. Some ideas include jars of fresh herbs, plants such as succulents, small mason jars of apple butter or other homemade seasonal jam, bunches of lavender, or individual flower bouquets. 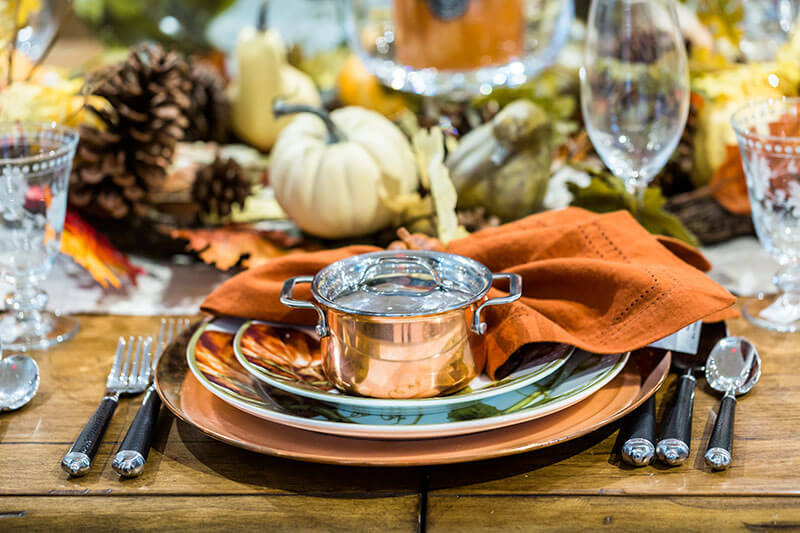 These decorating tips are sure to set the tone for your table this season. Happy Thanksgiving to you and yours! Pradera residents can enjoy the beautiful Colorado fall season on their own private golf course offering a variety of year-round recreation. Enjoy a stroll to photograph the lovely foliage; community members also have local access to hiking and walking trails that wind through the neighborhood space.